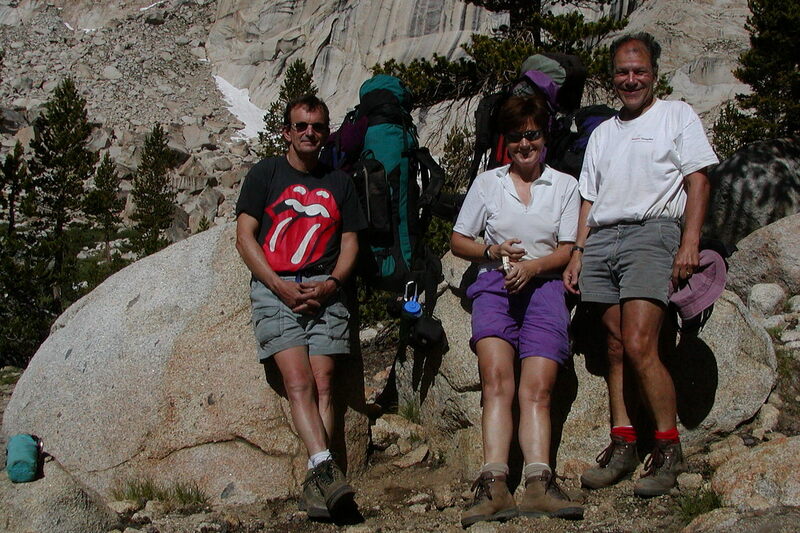 Looked up the photo archives and it was in July 2002 that we did our 4 day traverse, that might have also been the last time we drove that twisty road. This time we stayed the night in Visalia and turned off up to Mineral K ing at about 7:15 am and soon thereafter pulled over to let an impatient red wagon go by. Road up was quiet and we were caught off guard by the mass of hikers outside the ranger station at 8:30 am. I was given a number, #22 (groups ahead of us) and told they were servicing #13. Got our permit and drove off to the Franklin Lakes trailhead which was almost full. Parked and quickly readied our packs. In keeping with our new “lighter” mode we both weighed in at about 30 lbs and headed up the trail. It’s always a nice backwards view but soon turns challenging as the trail climbs past the lakes and up to the windy pass at 11,800. A 10.4 mile, 4,000′ foot grunt. Dropped steeply down the other side into Rattlesnake Canyon where we pitched our first camp, similar to 2002. I had thought we could have got further but we were both tired and 11 odd miles seems to be our comfortable limit. On the way in we nick-named groups that we passed or passed us. There was The “Solo Woman” stopped for a rest and the “Crazy Couple” who almost caught us but then drifted back. Above Franklin Lakes we chatted to “The Kids”, about 6 20 year olds planning to spend the night at the upper lake. We had a nice site near the river and during supper, around 5 pm, the “Crazy Couple” stop near us and we presume to camp. About an hour later Rose observes: “They’ve got their packs on and are readying to move out”. What? Sure enough they head off down the trail as darkness fell. Did they know it was New Moon and would be pitch black? Never saw them again. Up at 6:30 am, me that is, coffee, oatmeal & more coffee. 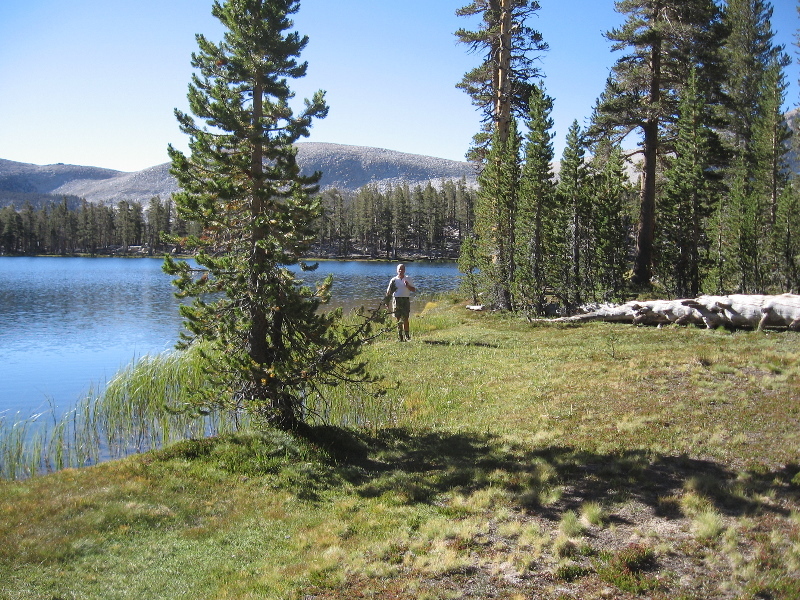 On the trail soon after 8 and we mellowed along to placid Forester Lake where we saw a guy breaking camp. 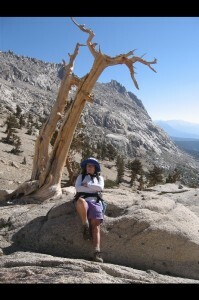 On the short climb up & over to Little Claire Lake he catches up and we chat a while. 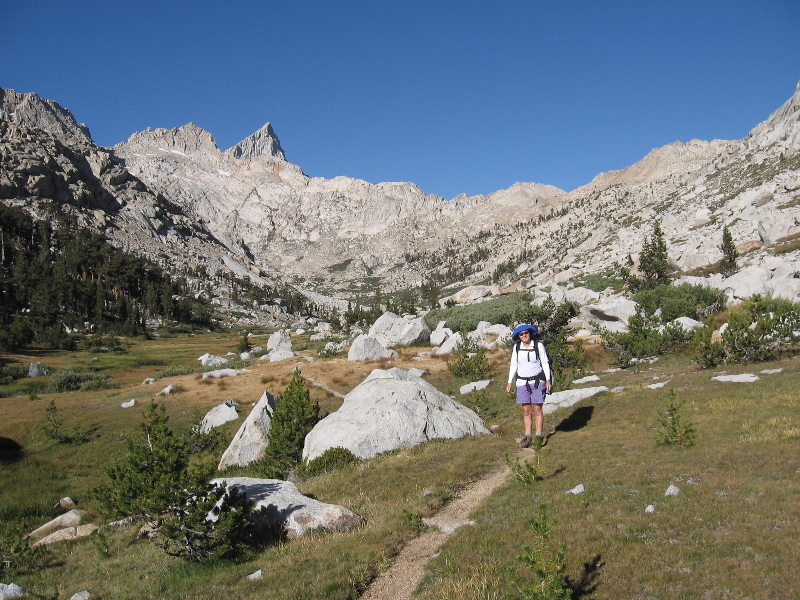 He is now “The German” and we drop steeply down to Soda Canyon and towards the Kern where we have to turn up and into Lost Canyon. I had thought we could do a slightly shorter version of the 2002 trip, via Big Five Lakes and cutting through Hands & Knees pass and back over Glacier Pass. I nixed that ambitious idea and went to Plan B which was straight up Lost Canyon and out Sawtooth Pass. 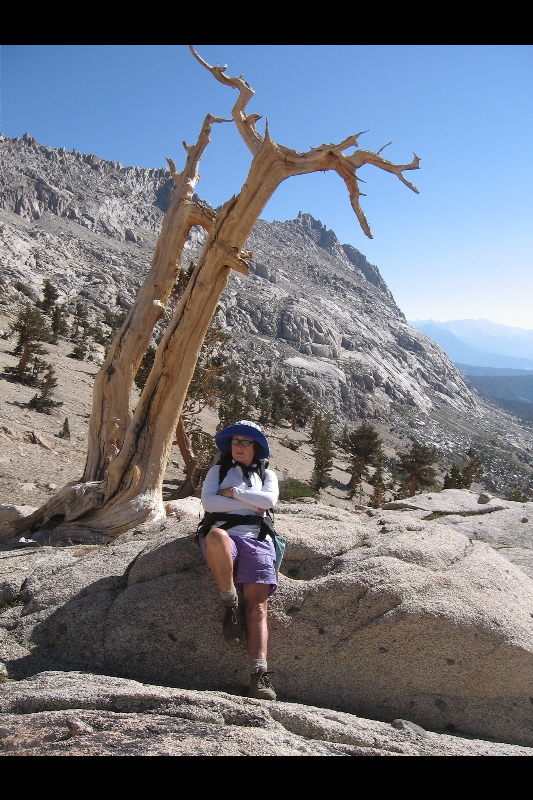 While still in Soda canyon we come upon “Solo Woman” sitting in the middle of the trail having lunch. We stop & talk, she’s from Springfield, near Porterville. We ask whether she saw the two night hikers and she actually referred to them as “The Crazy Couple”. She had passed them the day before and they had invited her to have dinner with them. He had said that once before he had been able to get to some or other place and that he was going to try to do it again. Their route had branched off from ours so we don’t have any further details. 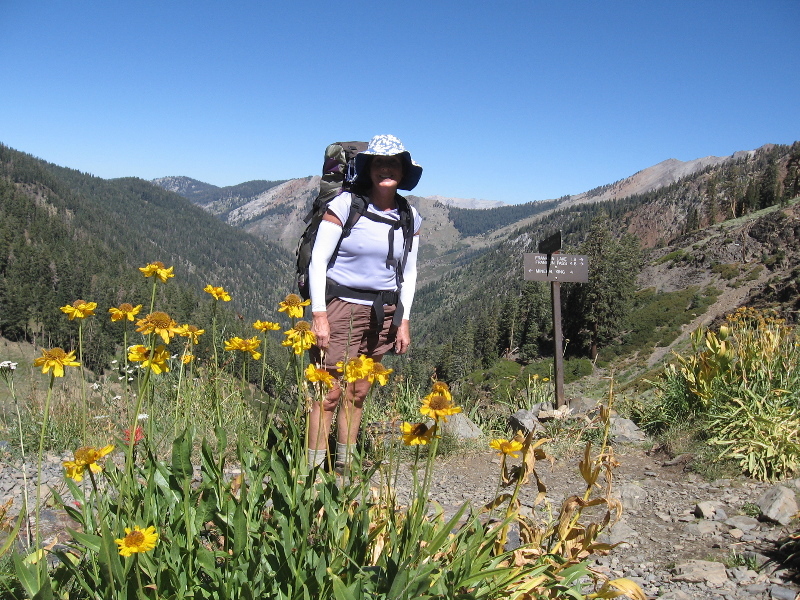 We leap frog each other once or twice as we head up Lost Canyon and at the turn off over to Big Five Lakes meet “The Crazy Women”, two women with massive packs. They were headed down the trail we’d come up and I asked if they planned to exit over Franklin Pass. No, they claimed to be on the trail for 2 weeks or more with no resupply? I could not grasp that they were carrying so much food/fuel and thought they were nuts. 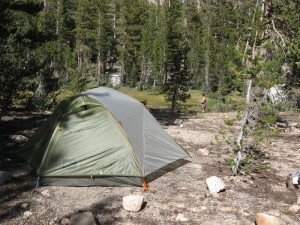 REI Quarter Dome T2 - 4 lbs! Lost Canyon gets nicer as you get higher up it, we see “The German” who has picked his site and we stop about a mile further at a nice site across the green meandering river and towering granite peaks. It was 3:30 pm and we had maxed out our 10 mile daily limit! Later on some more couples come through and a noisy bunch who we would later call “The Frenchy’s”. Monday morning it’s again up at 6:30 am, coffee to get Rose jump started and we’re on the trail at 8:30 climbing up to Lake Columbine and then Sawtooth pass at about 11,700′. It’s quiet, we think, and pass an empty yellow tent pitched almost on the trail. 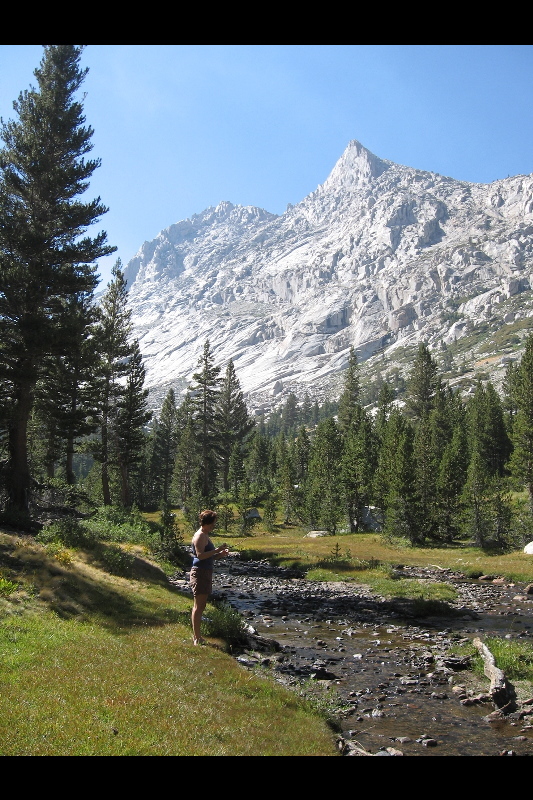 The upper section of Lost Canyon is really beautiful, above tree line you get beautiful views. We spot a solo hiker ahead and presume it to be “The German” but he disappears up the steep switchbacks. 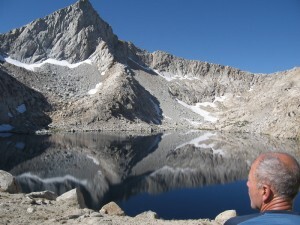 We grunt up to Lake Columbine and stop at the first crest. 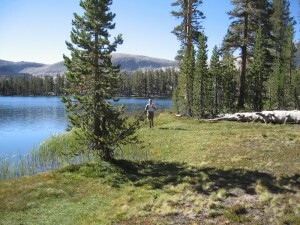 There are numerous hikers across the lake and we observe them and hence the tricky route up to the pass. Plenty of rock so the trail is circuitous in it’s steep twisty ascent. We follow on and my right knee starts talking to me on the rocky staircase like trail. The final section switchbacks up the scree slope and I am amused as the two hikers at the pass are “Solo Woman” & “The German”, “The Frenchy’s” having just left. 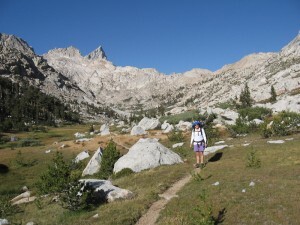 It is 11:30 am, a bit behind schedule, and we half walk half slide down the scree slope to Monarch Lake and down the never-ending trail to Mineral King at 7,800′, almost a 4,000′ drop. The ice in the cooler has melted but the champagne cold enough. We see “The German” leave in his Volkswagen Touareg and as we leave we see “Solo Woman”. Remember that red wagon driving in? Yes, it’s hers and Rose tells her she’s one tough woman to have done that hike solo!! A good end of Summer trip.